If you’re looking for hinges, we’ve got you covered. 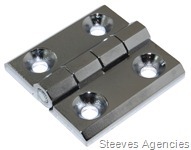 We carry a range of industrial and commercial hinges for almost any application. Check out our massive selection of hinges, from small and delicate hinges to super heavy duty versions. We have them all. Whether you’re working on a DIY project, repairing your trailer, or looking to design a completely new product, we can help you! There’s no minimum order on in-stock items! Just fill in this handy form and we’ll call you back immediately! Got any photos that might be helpful?